I’ve mentioned before on this blog how much I adore anything gel textured – gel moisturisers, gel bronzers, gel anything! 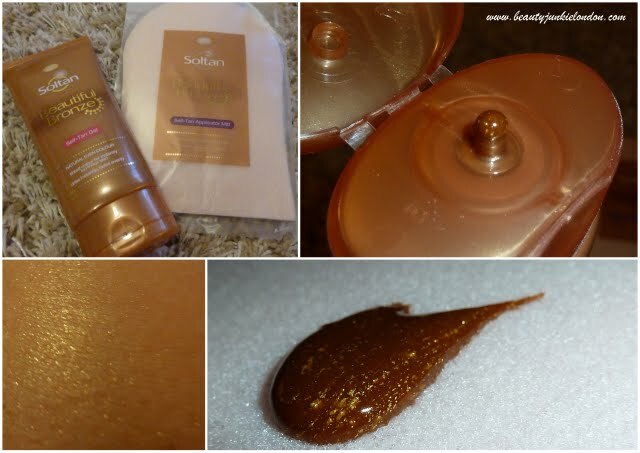 But I was yet to try a fake tan in a gel formula… so in steps Boots Soltan ‘Beautiful Bronze’ self tan. Top row: The product and application mitt. Bottom row: The tan applied (with glitter) and a close up to show the glitter. Having tried this out I can happily say that I still love gel formulas, the application of this was really quick, it applied, blended and dried really easily/quickly. There was little or no waiting time, having to hang around in the buff wating for it to dry. The colour that developed was mostly even, other than on my problem areas of my feet – I can NEVER get these quite right. If anyone has any miracle tips then I’d love to hear them! My only complaint with this is the glitter/shimmer. Yes, it’s pretty and I’m sure on the beach or on a night out it looks fabulous. But when I just want a natural looking tan then I resent looking like I’ve been bathing in glitter. I would absolutely LOVE to see this available in a glitter-free version! One thing I wanted to add was that I actually felt a bit hesitant in trying this because for some reason I have it in my head that cheaper fake tan products=orange. This isn’t the case and the colour, when developed fully with this was nice and natural – it has helped to change my misconception of fake tan products. A nice tan doesn’t always have to mean expensive products. I love me a good self tanner, so I may have to try and find this in the states. Went out and bought this today after reading your review, what a bargain!